Hi loves! Thursday, that means one day and it is weekend, yay! I had a lovely day at work - once every 2 weeks I work together with a colleague in Maastricht, which is a lovely city. Between our work we found time to take a little stroll through the city and the weather was so nice! I really enjoyed being out in the sun. We also had some delicious ice cream and after we walked further, I realized I left my iPhone at the stone wall we were sitting on... I ran back, and it was gone. I stressed because it is both my work and private phone in one. He called me, to see if it was still on. A man came walking towards us... he found it, walked around to see if anyone was missing their phone and wanted to go and sit down on the same spot to see if the owner returned! I gave him a big kiss and was just SO relieved. Wow, look at me babbling on.. how about some polish ;-)? Today I am showing you WingDust Space Cadet - this is totally Lucy's fault as she made me get this with her gorgeous swatch! 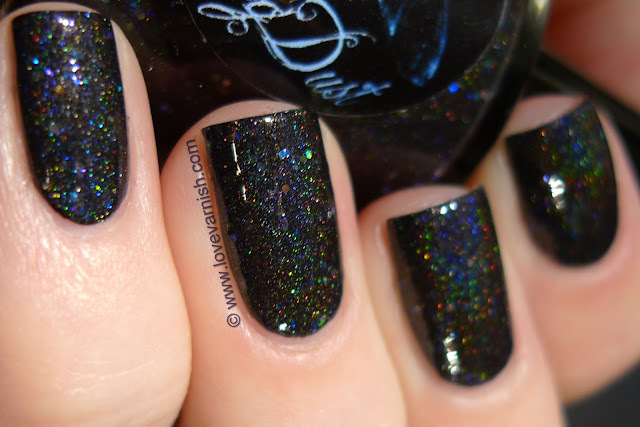 I really love WingDust polishes and Stephanie is such a nice girl - it makes me like the brand even more. 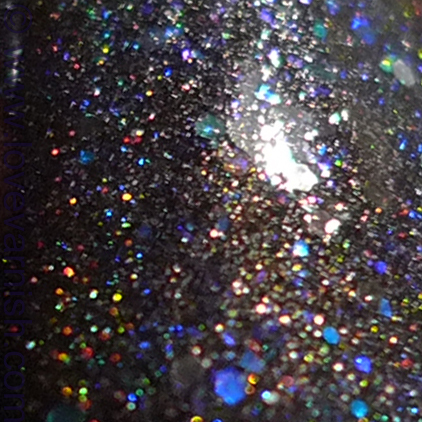 WingDust Space Cadet is a gorgeous black jelly base filled with holographic particles and glitter. It applies very easy and evenly though it is slightly on the thick side - I don't mind because it gives me more control of the formula and thinner can always be added if you like. I layered 2 coats of this beauty over 1 coat of Wet 'n Wild Black Crème, but I don't think this one needs undies as it is quite opaque! You can find WingDust Collections at various places, like Etsy, Facebook, Llarowe and Instagram. She ships internationally and most polishes retail for $ 8,50. I love the different size of holo in this. It is! Thanks for your comment Esther :). Doesn't it make you feel good when you realize there are still lots of genuinely kind people in this world?!? Pretty polish! Oh yes, Night Fury ♥ one of my biggest loves ever! Great to hear you loved the swatches and glad to help you empty your wallet haha ;-).